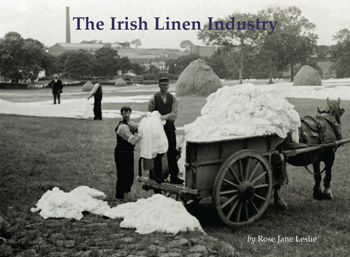 Linen had been made in Ireland since ancient times but mass production didn’t take off until the 1700s, beginning two centuries of world dominance in linen manufacture and by 1910 the export of linen goods from Belfast was more than all other countries combined. After the Second World War intense competition from the Fare East sent the industry into decline. The book is an illustrated history of the industry featuring evocative photos of the many mills and bleaching fields that once lined the riverbanks, as well as full colour adverts from companies such as Barbour’s who were once household names.